Did you ever get just the right novel at just the right time? God seems to work that way a lot with me. This fall my husband went on a trip to Nashville and brought me a book for my “souvenir.” He figured with a name like A Time to Dance it would be a sure hit. 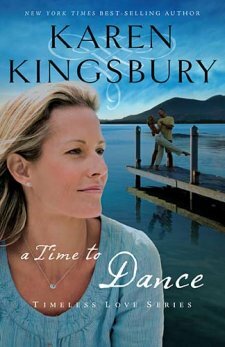 I wasn’t quite convinced I would enjoy a Karen Kingsbury novel, but I kept that little tidbit to myself. I did, in fact, love the title as well. So into my TBR stack it went, and I promised myself I would get to it soon. Once I finished my stint with reading sisterhood novels for my own research, I pulled out the Karen Kingsbury book. As some of you know, I have been going through some really tough times in my marriage, and around that precise moment I was closer to giving up than ever before. So can you guess what A Time to Dance is about? I’ll give you the brief rundown. After over twenty years of marriage, Abby and John are about to announce their impending divorce to their children. They’ve tried everything and have nothing left to give. But at the family meeting before they can share the news, their twenty-year-old daughter has her own surprise announcement to make. She’s engaged and getting married in the summer. Being the dedicated Christian parents that they are, Abby and John decide they will somehow figure out a way to paste on fake smiles and make it through six more months so their daughter’s day can be perfect. The book is all about marriages. How do they fall apart? What makes them work? What happens when they end? Abby and John are surrounded by a lively cast of secondary characters who each reflect this issue in some way. And, as I’m sure you figured out by now, this novel touched me in a significant way. I can’t promise that you will respond to it as strongly, but I think anyone will find elements in this book to change them and help them grow. Whether you have let yourself get caught up in the busyness of life and grow hard-hearted like Abby, escaped into an relaxing relationship with a supportive and flirtatious “buddy” like John, have given up on marriage like their future in-laws, or are looking forward to a perfect marriage like their daughter, no doubt you will find someone in this book to relate to. I related most to John. Although he never had an affair, over time his escapism with his “buddy” Charlene Denton did serious damage to his marriage. The other woman in the book, Charlene, was quite a character indeed with her subtle and patient seduction of John. She will serve as a cautionary tale for me for a long time. But John played along all too easily and contributed in his own way. Ultimately, the most important thing I learned from the book was this: it takes two people to destroy a marriage and two people to repair one. This novel encouraged me to do something God had asked me to do several weeks earlier, and that I had been wrestling with him over. To take a leap of faith hand in hand with my husband. So in a bold and unified move, my husband let go of some of his hurts and fears, and I let go of some of mine. We’re taking a leap of faith. I don’t know the end of the story, but I can tell you that things turned out well for Abby and John, and I’m hopeful that they’ll turn out well for us. This book was originally written ten years ago, but has recently been rereleased, just in time for me. What books have come to you just in time? What fiction books have changed your life? What messages have touched you? Dina, I can't tell you how thrilled I am about this 'book review'. Praise God for His gifts and perfect timing. Karen Kingsbury's books have reached hundreds of thousands of readers but for all we know, that book was written just for you. I'm so blessed by this. Thank you for your honesty and may God bless you and Dani in ways you'd never imagine! Thanks, Deb. I probably need to read this book about once a month for while. What a wonderful recommendation, Dina. I will have to put this book on my TBR pile too; it sounds as challenging as it is well-written. And I applaud anything that supports Christian marriage, because marriage is wonderful and blessed and God-given and Home, but it can also be really, really hard. Anyone who says differently hasn't been in it for long. I am so glad this story blessed you, and I pray that you and Dani will be given renewed strength as you move forward together! That was a really poignant review. This month's reading for me hit me personally too- Someone to Blame by C.S.Lakin chronicled a family going through a crisis that threatens to destroy them. Angel Harp by Michael Phillips is about a woman who takes a trip to Scotland and dares to live again. Loved that book!! This past week was Patti Lacy Week- read Rhythm of Secrets. A pastor's wife with a past must finally deal with who she really is!!! I love how fiction can help us to see life in ways that can give hope for the journey. I think this would be a great book to recommend to people in your church having marriage struggles, Susanne. Sometimes I worry about the romance genre, because it always ends with the couple getting together and a sense of happily ever after. Try happy for a few months and then the hard work begins. Cheryl, two other books I read recently that had powerful themes and really touched me were Embrace Me by Lisa Samson and Almost Forever by Deb Raney. I especially loved Embrace Me, but nothing I've read in years has hit home quite like this one for me. Those sound really good too, Dina. I agree with Cheryl - although I haven't rec'd my copy of Patti's Rhythm of Secrets yet, I beta read it before it went to print. I don't think a week goes by when I don't think about that story. I'm anxious to see the completed version. Great post, Dina. I'm curious though... did hubby ever say if he read the back blurb? Or did he buy it strictly on the title? He claims he bought it soley on the title. I don't think it actually said too much on the back. Cheryl, Patti will be here two days this week to talk about her book and her faith journey. I'll be reviewing her book on the 12th. I got my "Rhythm" copy in the mail today, Anita. It's amazing to hold it in my hand after having the privilege of 'beta reading'it. I'll have to look for Embrace Me, as well. IMO, this is Karen Kingsbury's best book, and my husband and I used it to give to couples who were going through marital difficulties. I did not know it had been reissued. Thanks for the review. I hope it will minister to many other couples. I figured people probably used this one for minsitry purposes. Dina, first, know that I am praying for God's blessing on you and your husband. Isn't it amazing how God works. Your husband picked the book for you based on the title, and it turned out to be so much more. I think I ave this book in my closet. I'll have to check and see. Thanks for your prayers, Suzie. I was really looking for some big miraculous healing in the area of my feelings, but its been more like chugging along and being obedient, which can be a little tiring.